Is your food poisoning you is the question we are going to address today. Anatomy and Physiology have to do with structure and function. Autotrophs have to have this molecule called a porphyrin ring to convert energy. Primary consumers need to have specific anatomy to be able to take this energy and convert it into the energy that they need. This is critical to understanding the answer to the question is your food poisoning you. The secondary consumer that consume the primary consumers need to have a specific anatomy to do that function. Everything has a function. It turns out that we are primary consumers. How do we know that we are primary consumers? Well, our jaws go up and down and they go sideways. And, we have cheeks and lips that get full and allow us to keep the stuff in our mouths as we are chewing it. This is unlike a dog where if they were chewing on grass, the grass would fall out of their mouths as their jaws only go up and down. They would have to keep picking the grass up over and over again. Humans are different from dogs. We are designed to consume differently. The dogs and the cats and the elephants don’t have to ask the question “is your food poisoning you” because they are still connected to the divine web called instinct. Humans on the other hand because we were cut off from instinct by the age of three have no clue. We don’t know what we are supposed to eat, we don’t know how we are supposed to sleep, we don’t know what we are supposed to do. Here Dr. Thomas Lodi Answers The Question, Is Your Food Poisoning You? Humans walk around asking, what’s the meaning of life? They don’t want to go to bed until 2am. Humans are completely cut off from nature. We live in these artificial things called cities inside of artifical structures and drive artificial machines. In turns out that being a primary consumer like all the land mamals, we all have this in common. We have horizontally moving jaws, cheeks, lips and muscular tongues with very long intestines. We don’t have the apparatus to kill. If we want to kill and eat a dead animal or eat a live animal we then have to get a tool. We were not designed by nature for this purpose. Conversely, when you look at omnivores which are animals that eat everything, they have a snout. Let’s take a look at some famous omnivores; a bear, a rat, a pig, a wild boar. They all have snouts because they have to be able to kill another animal when they don’t have access to eating anything else. Humans were not designed in any way at all to be able to kill and rend. Nor, do humans every look at an animal walking in a field and go yum, that would be delicious. Lions do, Cheetahs do, humans do not. Neither do humans come upon a corpse and say, I’m taking that home. It is against humans fundamental instincts to do these things. 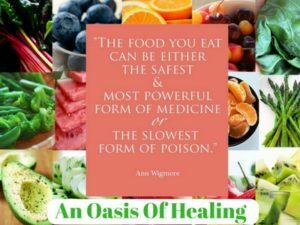 Let’s talk about what is food for any organism? Food is a substance that the organism will take in and convert it to it’s living structure. That which can’t be converted is going to cause harm unless you get rid of it because it’s going to get in the way. We can define that which we can’t get rid of as poison. So, we have food and we have poison. Food can be converted and transmuted and poison can’t, you have to get rid of poison. So, with this understanding, what are most people eating? People are eating 98% poison. People are eating dead animals, processed foods, junk foods, microwaved foods, etc, etc. Roughly only 2% of the population is eating a raw vegan diet. Let’s look at broccoli. Broccoli is full of things that can be transmuted into flesh and blood. What is in the broccoli that is so important? In addition to what we have identified as macro-nutrients which are protein, carbs and fats, and micro-nutrients which are vitamins and minerals there’s another element in this food that is absolutely essential, it’s called life. It’s the spark of life and that spark of life comes from light.